"I have to ask you something," Ron Wayne begins, as we stand to leave his office, signaling the close of our day-long conversation. He takes a slightly dramatic pause, adding, "compared to other people, is my life really that interesting?" This isn't modesty; it's earnestness. Wayne is genuinely curious about what makes his 77 years on earth so fascinating to have warranted my traveling across the country in order to spend a few days in his presence. I answer, honestly, that it's his time with Apple that has made him such a figure of interest. "Oh," he responds. "So it's my brushes with famous people. I'm a footnote in someone else's story." Thirty-five years ago, Ronald G. Wayne helped co-found the Apple Computer Company with two men 20 years his junior, Steve Jobs and Steve Wozniak -- names that have since become synonymous with the personal computer revolution of the early 80s. For Wayne, however, it was a gig that lasted all of a dozen days, abruptly ending when he marched down to the Santa Clara County Registry Office to have himself stricken from the contract he'd authored. His is a name that pops up every few years or so, shrouded in mystery, the "forgotten" or "unknown" founder of one of the world's most successful companies – and perhaps more infamously, the man who once owned 10 percent of its stock, only to walk away from it all a mere $2,300 richer. Wayne's name has popped up in the national news twice in recent months, first with the passing of Steve Jobs, and then with the well-timed appearance of an original Apple contract, dated April Fool's Day, 1976, signed by Jobs, Wozniak and Wayne, which fetched a staggering $1.6 million at auction - roughly 1,000 times the amount Wayne received to forfeit all claims to the company. The two Steves' signatures are downright childlike, compared to Wayne's barely legible scribbles – fitting, perhaps, given the then 41-year-old's role as the adult supervision for the company's other two fresh-faced founders. Three decades later, Wayne ended up here in Pahrump, NV, an unincorporated town roughly 60 miles outside of Las Vegas, a vacation destination for gamblers, when the vice-fueled human gridlock of the Strip or even Reno prove too much to handle. The folks who actually plant their roots here are, more often than not, the sorts who've made a conscious decision to go "beyond the beyond," in Wayne's words, to a wild west outpost, a desert hideaway relatively free from the intrusive arms of an overbearing government. You'll find Pahrump down US Route 160, which shrinks down to two lanes before winding across a red-rocked snowy mountain pass. Beyond that admittedly scenic bit of landscape, the 90-minute drive offers little more than miles of brush and yucca plants, sharp and solitary desert foliage that belong, perhaps, in the background of some Roadrunner cartoon. The occasional sign warns drivers to be on the lookout for stray horses, burros, cattle and landslides, and a wooden cutout of Smokey the Bear lists the day's fire warning (mild on this particular 30-degree day in early December). Beyond the mountain, the land flattens into the great expanse of the Nye valley, bordered by a range of peaks on either side, a landscape that chugs along without the slightest indication of human progress, until Pahrump materializes beyond the horizon. It's a desert oasis with a surprisingly massive sprawl; 34,000 people spread out over nearly 400 square miles – these are, after all, people who value space nearly as much as their privacy. Ten minutes outside of town, the onslaught of billboards begins, advertising $10 steaks, strip clubs and fireworks emporiums. The town's motto positions it as "your base camp to adventure," a transitory sense of adventure by proximity no doubt shared by the scores of teenagers growing up in a town where a visit to the nearest movie theater means an hour-and-a-half-long drive into Vegas. There is a bowling alley located deep within one of the local casinos, but, otherwise, the local high school students are generally out of luck in an entertainment scene tailored exclusively toward the 21-and-up crowd. At the edge of town sits a giant, white plaster castle, a combination "gentleman's club" and massage parlor. Hang a left there, and you'll find yourself on Homestead, a long country road where men in beards and cowboy hats do controlled burns of brush in their front yards. The road ends a few miles out, dissolving into desert. Sheri's Ranch and the Chicken Ranch, sit where the desert meets the edge of the road, neighboring brothels, the latter of which proudly served as the inspiration for 1982's The Best Little Whorehouse in Texas when it was located a few states to the east. Paranormal radio host and world class conspiracy theorist Art Bell also calls the area home, setting up camp amongst a sea of giant antennas, which dot the landscape like a metallic forest. This is the "Land of Nye" he referenced ominously at the top of every episode, having gone so far off the grid that even his replacement host, George Noory, reportedly has trouble contacting him. It's 160 that serves as the town's main drag, for a few minutes' drive, before filtering out again into the empty desert expanse. The street is lined with the town's three major casinos: Saddle West, the Pahrump Nugget and Terrible's – western themed; all of them. If any single entity runs this community, it may be the latter, its name shared with another sizable casino and a gas station at the edge of town. The street is also home to a number of chain stores – a Radioshack, Home Depot, several fast food joints and a 24-hour Walmart, which seem to have decimated a good deal of the local businesses, serving as the current center of commerce for the city. A few mom-and-pops do seem to be thriving along the stretch, however, like the Pahrump Adult Superstore (which is roughly the size of a department store) and a number of fireworks emporiums, which seem to outnumber supermarkets in the town. I meet Ron Wayne my first morning in town. He's waiting for me in the lobby of my hotel, a small man sinking into a leather couch, largely obscured by the newspaper he's reading. I greet him and he stands to shake my hand, "Mr. Heater, I presume." He's dressed sharply, with wire-rimmed glasses and a suit jacket over a V-neck sleeveless sweater, a large 70s-style collar jutting out over both. He'll wear this outfit both days, a quiet reminder of his former co-worker's fascination with the concept of a daily uniform. His white hair is brushed back, thin on the top and long in the back. He's in excellent spirits, that much is clear. And like that, as he puts it, "we're off like a pack of turtles." I follow Wayne out to his car, a 2002 Chevy Malibu – the same year he left Florida and packed up for Nevada. The car has served him well, he explains. He's driven it across the country several times. There are a number of stickers lining the rear passenger window, including a small rainbow Apple logo. There's not much in the way of small talk as we drive to breakfast. Wayne instead launches almost immediately into his current passion: economics. It's a subject that has fascinated him for his entire adult life, culminating with this year's publication of Insolence of Office. "If I have one legacy," he offers up as we exit the Malibu and walk toward the Pahrump Nugget in the cold Nevada morning air, "I hope it's that book." Over the course of our two days together, we'll eat all of our meals at two different casinos – the Saddle West and the Nugget. Pahrump isn't much on fine dining. There's a steak house in the Nugget, a few coffee houses and a handful of Mexican restaurants, but, otherwise, the majority of the dining establishments in the town involve heating lamps and / or the word "buffet." Today we wind up at the Saddle West for breakfast, after our first choice proves surprisingly hopping on a Tuesday morning. Wayne gets eggs and sausage from an exposed steam tray and jokes about his cardiologist's reaction, picking up where he left off in the discussion of global economics. It's a subject that truly requires Wayne to start from the beginning, tracing matters from the barter system to the advent of paper money, the abandonment of the gold standard and the pending global economic collapse. Wayne's history with the subject began around his twentieth year, a fascination he chalks up to growing up a child of a single mother in Cleveland during the Great Depression. All roads lead to a single conclusion for Wayne: the necessity of investing in precious metals. It's a lesson he's actively attempting to impart on me and one he shared with a young Steve Jobs, who promptly sold his investment, once the value went up. "I'm not sure he entirely understood what I was trying to tell him," Wayne explains. Gold and silver aren't an investment for Wayne – they're security, a protection from a time in the future when the uselessness of non-metal-backed paper money becomes too apparent to ignore; when China does something to address the US' massive debt. I wonder how many of us would have accepted the gift of life, if we'd first taken the trouble to read the fine print. These are subjects tackled by Insolence of Office, a 260-page treatise on shielding oneself from the impending economic and societal collapse, featuring chapters with titles like, "The End of the Republic," "Morality and Sexual Preference" and "Illegal Destruction of Fixed Currencies in the United States." The book opens with a rhetorical question: "I wonder how many of us would have accepted the gift of life, if we'd first taken the trouble to read the fine print." It's a question that could apply to Wayne's own rollercoaster-like existence. Insolence was published earlier this year by 512k Entertainment, the company behind Wayne's recent autobiography. Its founders first approached Wayne to be interviewed in their 2009 documentary, Welcome to Macintosh, an appearance he agreed to make with one major caveat: that they read his magnum opus and consider the possibility of using it as the basis for their next film. The manuscript, however, was too dry for such things, according to Wayne. Eventually, though, another mutually beneficial deal was struck between the two parties, with 512k agreeing to publish Insolence, if Wayne agreed to write an autobiography for the company. The result was Adventures of an Apple Founder – the title, Wayne happily confesses, was his own, an attempt to capitalize on an increased interest in recent years regarding his brief role with the company. In spite of such titles, however, the book only devotes roughly a dozen or so pages to exploring Wayne's role with Apple, spending far more time on subjects like his time at Atari – the place where he was working when he first encountered a young Wozniak and Jobs. It also delves a fair amount into his lifelong interest in the world of slot machines, a key aspect of Wayne's life seemingly at odds with the value he places on money and a large part of the reason he wound up here in Pahrump. For his part, Wozniak graciously wrote the foreword to Adventures – something Jobs outright refused to participate in, telling Wayne, bluntly, "I don't think you're a founder of the company," in an email – it was their first communication since 2000, and it would ultimately prove to be their last. "[Wozniak] was extremely generous in that writing in terms of what he regarded as my contribution to the front end of the thing," Wayne explains, taking a break from his plate of scrambled eggs. "It was much more so than I ever considered myself. I regard Steve Wozniak as, not only a whimsical character - he's a delightful person to know and be with - but as one of the most gracious men I've ever met in my life. I remember when this meeting occurred at the Macworld Convention in San Francisco, there he was and from across the room he greets me like a long lost brother." As for Jobs' personality, Wayne is similarly candid, saying with a smile, "I always tell people that if you had to choose between Steve Jobs and an ice cube, you'd stand next to the ice cube for warmth." I really believe I will probably wind up as a footnote in history because I happened to have known someone. Wayne regards the fascination surrounding his time at Apple with similar amusement. "Every couple of years or so, somebody will suddenly wake up and say 'Oh, Mr. Wayne, let's find out about him,'" he explains. "And of course every time anything significant happens with the Apple Corporation, here come guys after the 'unknown founder.' To me it's a mystery. I really believe I will probably wind up as a footnote in history because I happened to have known someone. The reality is that I was a co-founder with Steve Wozniak and Steve Jobs of the Apple Computer Company. I had absolutely nothing to do with the corporation that followed." Wayne traces such interest back to 1994's The Mac Bathroom Reader, a curious little book of Apple trivia with a cover featuring a rubber ducky and a roll of toilet paper. The book's author, Owen Linzmayer, happily cast Wayne as the "forgotten founder," borrowing that phrase for the first chapter of 1999's Apple Confidential. Our conversation is interrupted by an older gentleman, who stops by to shake Wayne's hand. He explains the situation to the man with a customary sense of humility and levity, as though he's still not entirely sure why I have ventured this far to talk to him. The man shakes my hand as well and is on his way. He's a fellow hobbyist, Wayne explains, a buyer of coins. 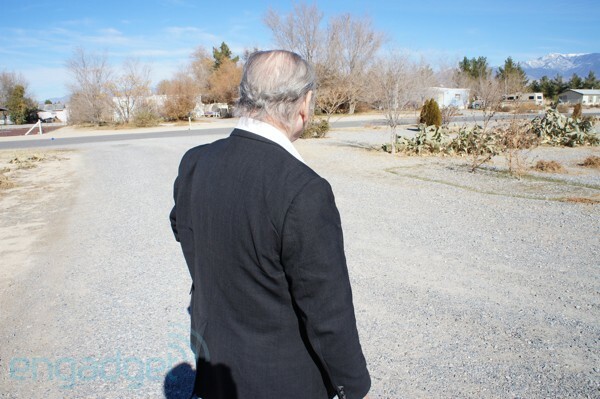 In spite of having lived in Pahrump since 2002, Wayne doesn't really know all that many people around town. His social engagements are largely limited to clients and a poetry club that meets for two hours the first Saturday of every month at the Pahrump Library, where Wayne indulges the group with one of a number of his creative hobbies, including his most ambitious work, Grecian Treasure. The mystery story is comprised of 26 sonnets, opening, "On damp, dark streets of London's night, a lonely click of footsteps sound, attendant to a common sight... an average man, now homeward bound." Wayne freely admits that he leaves his house as seldom as possible, a fact that has gone a ways toward furthering this perception of him as a mysterious figure in Apple's history. It's also, apparently, given him an air of mystery around Pahrump. When I pop into a small, newly opened computer store a few days later, I ask the owners if they know Wayne. "Ron Wayne?" one asks. Is he a local politician?" "No," I answer. "He's one of three co-founders of Apple. 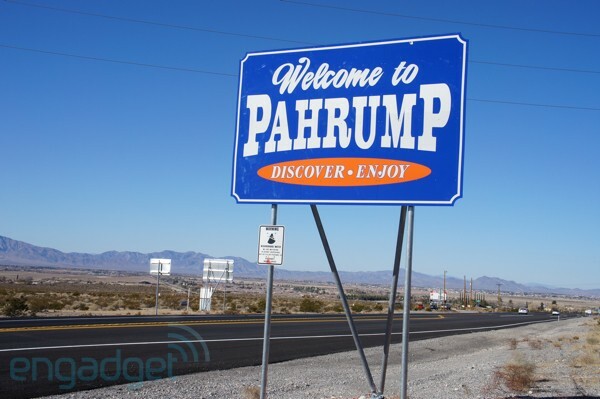 And he lives here in Pahrump." "Oh," responds the other, "he was on the local news recently, after Steve Jobs died. He's a bit of a recluse." In part, Wayne chalks his sedentary nature up to the fact that he works from home, making himself available to clients who call his house throughout the day, hoping to swing by to make a deal. Wayne deals in coins and stamps, a hobby of sorts that supplements his Social Security checks in his semi-retirement. 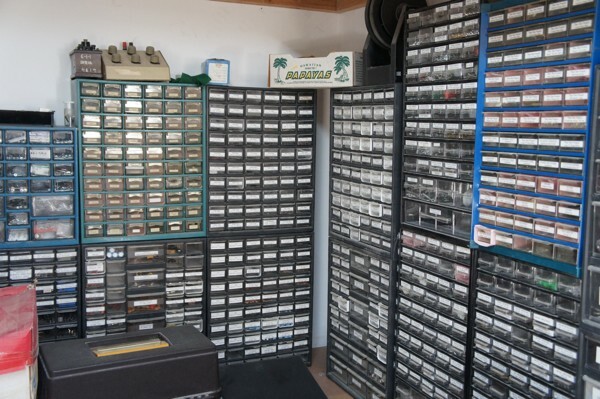 At one point, the hobby was a full-time business, taking the form of a shop in Milpitas, California, but Wayne prefers the low overheads of his current setup -- a home-field advantage that lands him in the proverbial "catbird seat," as he puts it. He's come across the majority of his fellow traders by way of a now-defunct swap meet in the area or two small, text-only ads in the back of the local Nifty Nickel – "Buying old stamp collections, US & World, pre-1950 also coins, coin collections & unused bulk postage," reads one, in part, measuring roughly an inch across. Having significantly overstayed our welcome, we jump back in the Malibu and are once again off like the proverbial "pack of turtles." It's a bit of a drive to Wayne's house. "You need a car to live here," he tells me, adding, "Though you see more and more people on bicycles, these days. I think you're going to see more and more of them in the future. We're headed toward dark times." Like many in the area, Wayne's house is of the small, pre-fabricated variety. It's covered in blue vinyl siding, with a small adjacent garage, which Wayne converted into a workspace, when his adopted family moved in with him. Two large carports sit out in front, protecting their vehicles from the oppressive desert sun. 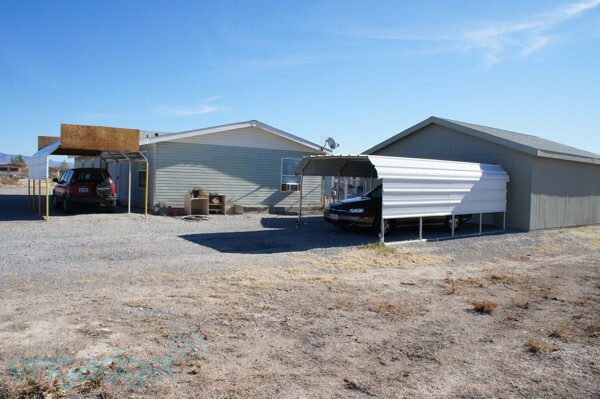 Out back, another mobile home and a trailer form a triangle with a small plastic swing set and a lawn of yellowed grass in the middle, a casualty of the poor desert soil, where not a whole lot of anything grows naturally. Two dogs bark furiously behind an iron gate – Mica, a large black mixed breed and Hercules, a fierce little Chihuahua with a Napoleon complex that needs to be locked up in a bedroom when strange reporters come to town. There are five dogs in all living at the house, according to Wayne's estimate – though he can't be entirely sure that the number is correct. They are "beloved pets," according to Wayne, but they'll certainly give a start to strange reporters or anyone else who might approach the home. 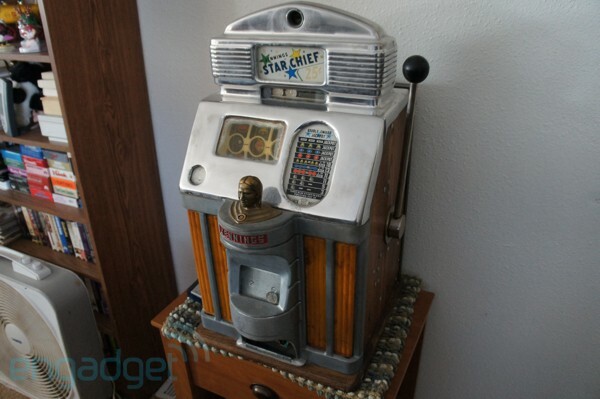 Make it past the over-excited pack of dogs, and you'll be greeted by a Jennings Star Chief, a vintage quarter machine with a big brass Indian head sitting above the coin hopper. It's an immediate reminder of one of Wayne's other passions: slot machines, a long time love that certainly played a role in his decision to relocate to Nevada. He settled into the industry after a stint working at the Lawrence Livermore Labs and a number of shop jobs. The questionable business practices he encountered working in that industry earlier in life also played a part in his decision to walk away from Jobs and Wozniak early on. As with most other subjects, Wayne starts at the very beginning when describing what precisely drew him to the machines in the first place. "They have a character to them," he explains. 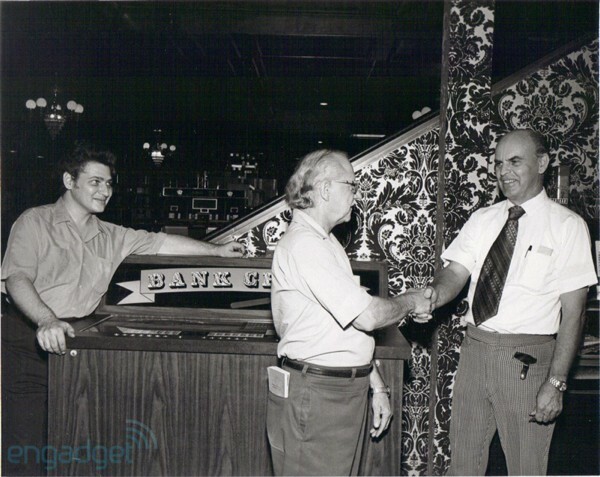 "They have a history to them going all the way back to Charlie Fey in San Francisco in 1895, selling bar supplies, and in his garage, he tinkers together the first slot machine. The mechanics of it, the mathematics of it, the symbolization that he had mastery of that fascinated me." It's a sort of mastery Wayne believes has been drained out of most mechanical fields. But as with so many other areas, the world of slots left Wayne behind. The machines have since moved to what he's deemed a "paper in, paper out" system, printing out slips with small amounts of money, instead of the tangible coin drop – a not so subtle reminder, perhaps, of his larger concern with a society-wide move toward paper currency. Manufacturers have also moved toward microprocessors as a way of beefing up security, deeming the more traditional machines too easy to manipulate. "All they did was shifted the realm of theft. Instead of someone coming in and cheating the machine for twenty or thirty bucks they've got guys who come in and cheat the machine for ten million dollars," he says. "The level of theft has gone up and become more sophisticated." The move toward more sophisticated electronics has also made it easier for the casinos themselves to game the system. "It's bad enough when a game of spinning reels isn't being decided by the random stop of the reels but is being decided instead by an electronic set of reels that are telling the reels where to stop," Wayne explains with a fair amount of passion. "It's worse when you are looking at a 20-stop mechanical wheel being driven by a 256-stop electronic reel and you think you're playing against 8,000-to-one odds and you're playing against 16,000,000-to-one odds." Though such unevening of odds has, over the years, afforded Wayne the opportunity to turn the tables from time to time. "I was packed up and leaving [a Las Vegas hotel] and right next to the register they had this bank of these Twenty-One machines," he says, beginning what is clearly a favorite anecdote. "So I went up to the first machine and loaded it full, played it and won. I won about five or six hands, the first hand I lost. I go on to the next machine and did exactly the same thing, I went right down the row. I looked like Captain Kangaroo as I was going out the door with my pockets full of quarters. That was one instance when I had recognized what was going on." 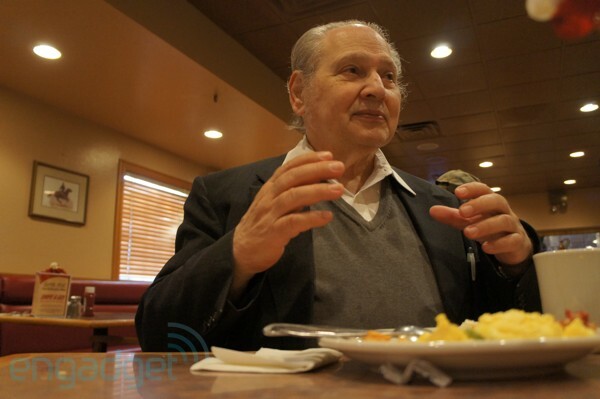 Wayne is full of such stories, a close study, he's spent decades wandering casinos, looking for patterns, recognizing and taking advantage of attract modes designed to draw overzealous gamers to machines. He still frequents a local casino a few times each week, a rare regular excursion from the familiar scenery of his home / office, finding himself in the dimly lit confines of the Mountain View, a small casino far from the relatively fast pace of the highway 160 casinos, between 11:30PM and 2AM. He hits the Kenny Rogers Gambler and Cleopatra, machines with decent payouts, both. The man so preoccupied with global economics has no illusions that he'll get rich from such activities, instead writing the whole thing off as an amusing diversion, heading home for the night when he hits his self-imposed limit. It's a significant act, he insists, which separates him from the more compulsive sort. Wayne still entertains fantasies about getting back into the other side of the business, however, including a prototype for a machine he says he came close to selling to the Terrible's chain, before financial concerns intervened. On the side of his main room opposite the Star Chief sits a large tube radio, roughly three feet high. Wayne walks over to the beautifully restored piece and fiddles with the knobs for a few minutes, ultimately unable to get any kind of signal, in spite of the large mesh antenna he had built for the system. On top of a small bookcase is a small model, a remnant of a large replica he built of the Nautilus from 1954's Disney adaptation of 20,000 Leagues Under the Sea, using video shot from television, played back on a reel-to-reel machine as reference. Wayne considered the whole project something of a psychological rehabilitation from an unfortunate work experience, just ahead of starting his gig at Atari. Wayne built the sub with assorted pieces from tank sets and dollhouses, amongst other things, with a near obsessive level of detail paid, right down to the lighting and the gilded ceilings, created by painting doilies. Along the wall in the connected dining room is a large shelf stocked with rows and rows of VHS tapes, each featuring a cryptic numbering system – it's all part of a cataloging system Wayne developed, with binders detailing the corresponding classic movies recorded off of TV onto each tape. He's also cataloged clips from the Rachel Maddow Show and Countdown, before Keith Olbermann jumped ship to Current. He's particularly taken with Maddow's anecdotes, which help offer fodder for future political discussions. There's an extensive collection of firearms scattered throughout the home, as well, hanging from walls and sitting out in the open. And in his bedroom, a small closet-like space bearing a piece of paper with Dante's familiar, "Abandon hope all ye who enter here," on the door, Wayne picks up a large revolver from a dresser next to his unmade bed, opens the chamber and lets the bullets fall from the cylinder into his palm. 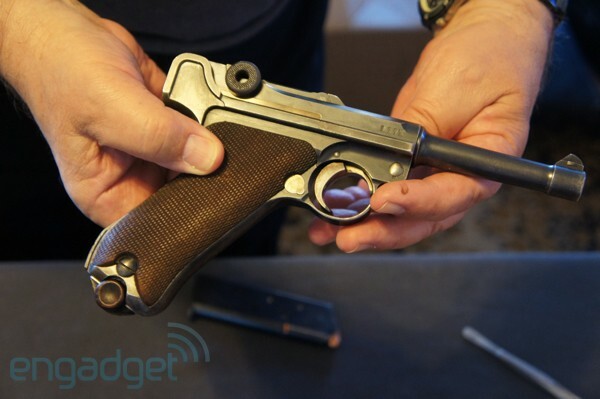 It's a police-issued .38. It's one of possibly dozens of guns in the small house, many of which are of the ancient sort, including a musket that Wayne would take shooting in the desert until cleaning up the gunpowder trails proved too much of a chore. Wayne shows off gun after gun, quite proud of his collection, including a palm-size .25 Colt automatic. Wayne's office is located just off of the main room. It's a small space with two large windows and shelves devoted to his extensive collection of cataloging just about everything. On a wall next to the bookshelves hang a number of antique guns and swords, with a miniature cannon displayed above the door. A couple of paintings sit on adjacent walls – one features a stern-faced Abraham Lincoln around the time of his Cooper Union address. The other depicts a fierce battle scene, part of a series for which Wayne only completed two paintings, the second hangs above his bed in his nearby railroad-connected bedroom. Both are evidence of yet another hobby, which manifested itself most famously when Wayne designed Apple's extremely un-Jobsian logo, a woodcut-like image of Sir Isaac Newton sitting beneath a tree, one well-placed falling fruit away from inspiration. An old clock ticks away the seconds loudly, and across the room, a small cardboard box sits under a chair, with the words "FAN MAIL" typed out in big block text (during our time together, we'll swing by a small post office housed in a pre-fab building to mail out a signed copy of Adventures). The room is also scattered with assorted memorabilia of Wayne's long, strange trip. There's an image of a young Wayne smiling faintly in a lab coat at his then dream job at Lawrence Livermore Labs, an image of him smiling larger while working at Vegas' Golden Nugget Hotel & Casino, a handful of patent papers brandished with their original red and blue seals and a glossy shot of the Vulcan slot machine he created, a name betraying his love of all things science fiction. On his desk is a low-level Dell desktop with a bundled flat screen monitor purchased about a year and a half ago. Much to Wayne's chagrin, the system was running Vista, rather than the Windows XP to which he was far more accustomed. "I didn't know if all my programs and files would work on Vista," Wayne explains, with a hint of exasperation. I've got an accumulation of 20 years of this stuff and I don't want to lose it all simply because of this wonderful new technology for which I have absolutely no use of anyway." He eventually caved and bought a cell phone as well. 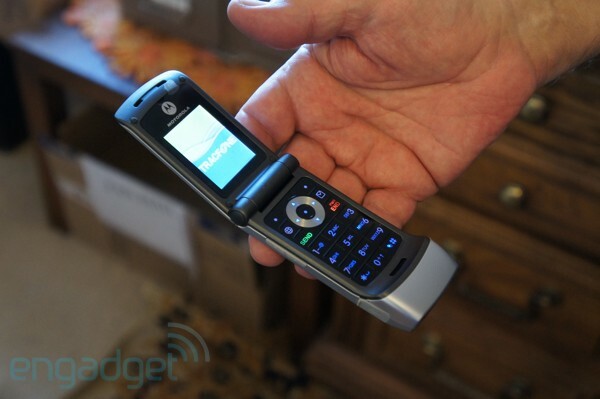 Wayne owns an old Motorola flip handset, which he rarely actually carries on his person, instead relying on customers to utilize his landline. Wayne, somewhat famously, never owned an Apple product until quite recently, when an interviewer gifted him an iPad, and while he was taken with the tablet, it eventually found its way into the hands of Wayne's adopted son, who now claims full ownership of the thing. The room's real treasure trove is housed in a first class USPS mailer. Wayne pulls the contents out and places them on his desk. There's an original Apple I warranty and manual, the latter of which feature's Wayne's Isaac Newton logo, and, compared to the current crop of user friendly technical manuals, reads as though it were written in some alien language. An order form for its follow up is also mixed in, imploring buyers to "get on the list and receive your Apple II before the rush." 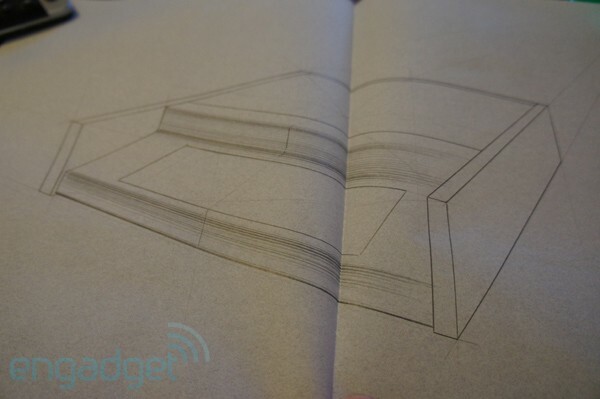 Pages and pages are devoted to plans and pencil drawings of an Apple I enclosure, which Jobs enlisted Wayne to create after he unceremoniously exited the company. The wood-paneled housing was designed to be low cost, featuring a sliding door meant to shield the keyboard, which would turn the computer on when open. "To this date, I've never seen this idea implemented in any computer design," Wayne writes in Adventures. "Then, I suppose it has only been 35 years, and it takes a bit of time for good ideas to finally come into practice." Apple, for its part, passed on the prototype. The envelope also houses a photocopy of the original Apple contract, penned by Wayne himself – a fact that quite impressed Wozniak. It was Wayne's copy of the contract that wound up on the Sotheby's auction block. The co-founder parted ways with the contract back in the early 90s for around $500, when an autograph dealer asked if he might have any signatures of value. It's one of a number of misfires that dot Wayne's life, one of the few he describes with a rare regretful tone. [Jobs and Wozniak] went on and did their thing, and they did it magnificently. I could not actually have been a part of it. Mentioning the Statement of Withdrawal of General Partner, a copy of which also lives in the envelope, however, won't elicit any self-pity from the man. "I have no disappointments," Wayne explains. "[Jobs and Wozniak] went on and did their thing, and they did it magnificently. I could not actually have been a part of it. There were just too many aspects of it. My participation with Apple would have gone against my ambitions in life. I wasn't seeing, in the Apple phenomenon, anything that fit what I regarded as my approach to life, what I wanted to make my life mean in the course of my activities, what I was searching for." Wayne recognized something in Jobs and Wozniak, during his time at Atari, forming a particularly strong bond with Jobs, which involved deep discussions over lunches and long walks. "We'd have lunch together, we'd have dinner together, he came over the house for dinner, we'd have walks and physical activities. We went for walks together and we talked. He told me what his plans and ideas were and was bouncing them off of me. Should he really go off in this direction or that direction?" Wozniak was the engineering genius who designed computers for the sheer fun of it, and Jobs was the consummate businessman who turned it into an industry. "Jobs had a very focused attitude, and I knew he was going to go someplace and he was going to make sure he got there," explains Wayne. "He couldn't match Wozniak, but he recognized the significance of Wozniak. The reality was that Jobs had a focused intent to do something dynamic in business and he would get there on whatever device would carry him." "If he'd lived in the 1830s and had met Sam Colt, he would have ridden to his success on the Colt revolver," Wayne adds. "The device was just a means to an end. He'd actually asked me if he should go ahead with this. With Steve Wozniak. He was concerned about it because there were all these other interests that he had and he was afraid that he would lose out on these other interests if he pursued this enterprise. And I said 'Well, you could pursue these other enterprises more easily if you had money in your pocket, and this looks like a money making thing. Go ahead and do it. Take the money and do your thing.' "
But at 77, Wayne has no desire to pull punches when describing the late former partner. "He was -- not to put too fine a point on it -- a ruthless businessman. Absolutely ruthless, I had a first hand experience in that. I was one of the few people, I think, who actually said 'no' to him and he didn't like it." Wayne said 'no' by turning down two separate job openings offered up by Jobs himself after leaving the company, a fact he insists backs up his claims of not regretting his exit from the company. "If I had any regrets," Wayne says simply, "I would have picked it up on the first pass." Wayne would have been a poor fit for the company, he insists, with Jobs relegating him to a backroom administrative role, rather than allowing him to get his hands dirty with the engineering work he thrived on. So, in spite of that momentary diversion, he remained at Atari during those infamous 12 days. It's out of his office that Wayne runs his coin and stamp business. His workshop, meanwhile, holds the link to his electronics past. The space is housed in a converted garage he began setting up shop in, after his adopted family moved in. He tells me that he's going to invest more time into the space once the current resurgence of interest in his brief time with Apple settles down – at the moment, the space really does feel like a garage, with countless boxes piled everywhere, bearing descriptors like "Scrap Plastic" and "Integrated CKTS" scribbled in Sharpie. There are ancient pieces of electronics scattered throughout and some heavy-duty shop equipment on a couple of workbenches. Hundreds of tiny drawers line two walls, each with a small label describing their contents, all minute electronic components. Wayne pulls down a small black box, fires it up and begins fiddling with its knobs, emitting a high-pitched squeal that changes tones as he adjusts settings. "This," he tells me with a smile, "is a 'Do-Nothing' machine." There are some boxes here and in a rented storage space filled with slot machines Wayne built, having re-entered the field for some time after his brief stint with Apple. Those boxes, like the rest, represent the past, a long history in electronics that has seen him traveling across states and industries, in search of the next adventure. They also offer a potential future for a restless mind that hasn't slowed down in this state of semi-retirement. On the other side of the garage is a giant black railroad safe, the words "Railway Express Agency" written in faded, rusted script, over an even fainter "Wells Fargo." The safe belonged to two different railway companies and sits in Wayne's garage, now emptied of its valuables. It's a two-ton beast that appears impossible to crack, though he admits that someone managed to do it before – an inside job, perhaps, robbing Wayne of his life savings. It was a tragic event that played a large role in his decision to move out to Pahrump. We head back through the house to the Malibu. "People always ask me where Jobs got 'Apple,'" Wayne offers without prompt on the final drive back to my hotel. "I never thought to ask. I suspect it has something to do with 'bite' and 'byte.'" "You must have liked the name," I offer. "It was his decision to make," he answers, simply, without a hint of judgment. "Well," I respond, "If you hadn't, I'm sure you would have said something." "True. And it gave me plenty to work with for the logo." "And Wordsworth," he answers. "I don't suppose you know Wordsworth." It's a fragment of "The Prelude," a name Wayne can't remember for the life of him, in spite of his own flawless repetition of the familiar snippet. The final part had found its way onto the wooden border of Wayne's infamously ornate logo, some 35 years prior, a stream of words interrupted by a waving ribbon bearing the words "Apple Computer Co." I roughly paraphrase Jobs biographer Walter Isaacson's suggestion that the borrowed slogan "fit Wayne's self-image more than Apple Computer." Wayne smiles at the suggestion, adding that he certainly can't argue with the assessment. The whole logo was 100 percent Wayne, and it was the first thing to go, with the entrance of marketing guru Regis McKenna, according to Isaacson, replaced by the far more familiar – and Jobsian – bite image, which has existed as the company's logo in some form or another ever since. Wayne insists that Jobs liked his Newtonian contribution enough to have it blown up into a banner for promoting the Apple I at tradeshows. Fittingly, perhaps, the Victorian logo was a poor ill fit, just like Wayne himself. It was a story, Wayne candidly admits, that he only read a small portion of, hunting for mentions of his own name – a modest undertaking, given his rather scarce face time in the 656 page tome, coverage which Wayne refers to as "curt." But then, in spite of its adventurous subtitle, Wayne's own autobiography devotes a mere dozen pages to the matter – arguably a generous sum, given his 10-day-long employment with the nascent company. It's a stretch of time that can hardly even be regarded as a pit stop in Wayne's sometimes lonely perpetual voyaging. This piece originally appeared in Distro #18.